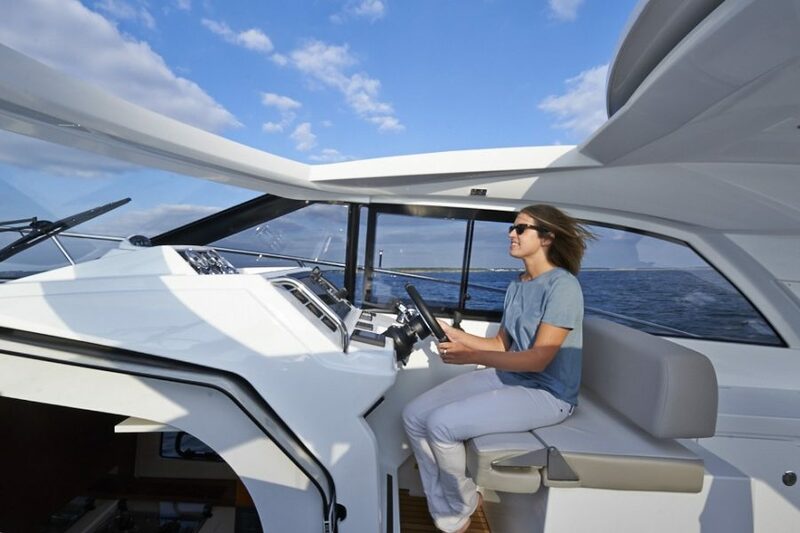 2019 Jeanneau Leader 40 offshore diesel cruiser with 2x Volvo D4 300HP inboard engines. 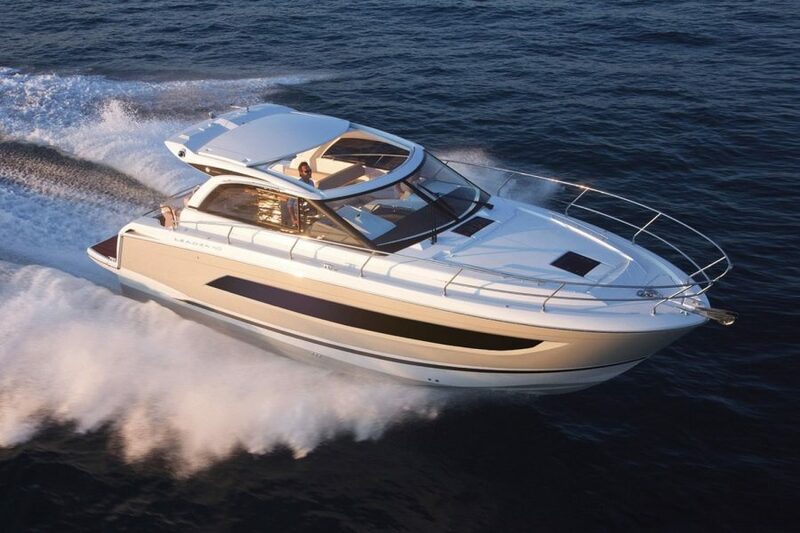 This is a stunning Sport top version with electric sliding roof, two cabin layout plus permanent aft sun deck and forced air diesel heating. 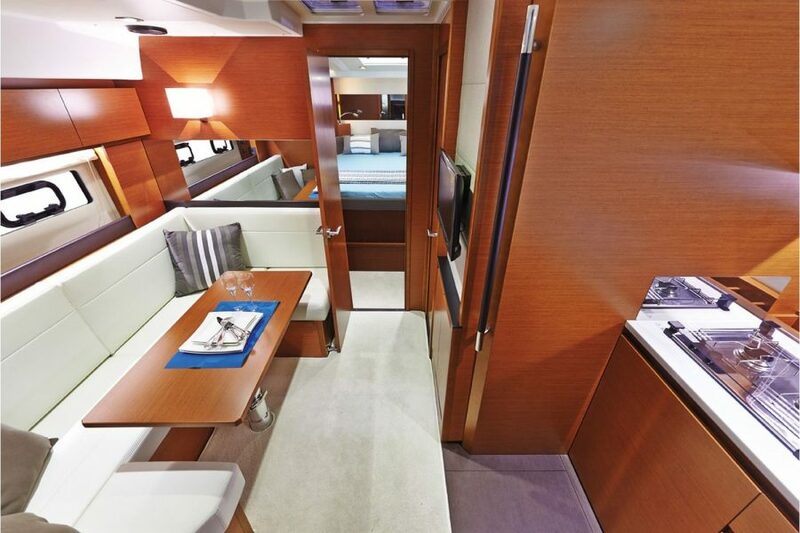 This boat includes Trim Level Premiere (teak cockpit floor, LED lighting, extra deck hatches, portholes and windows) and upgraded galley. Full suite of Raymarine electronics including fishinfinder / chartplotter and shore power. 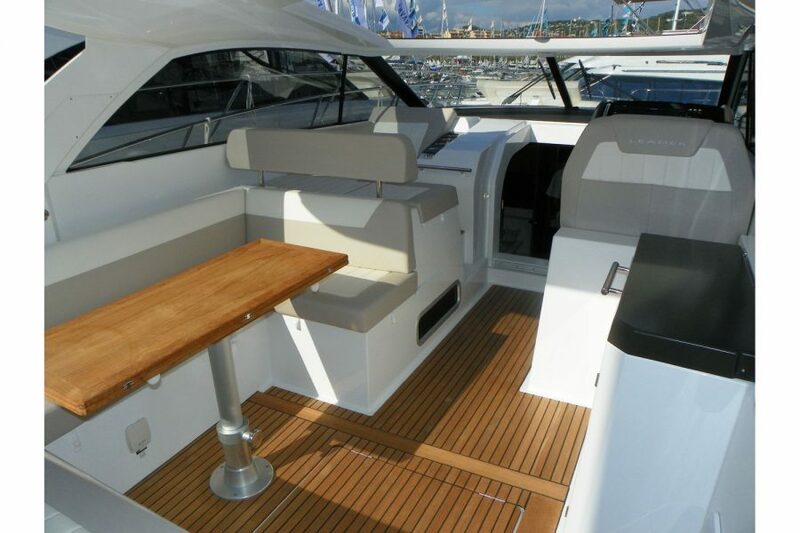 Price includes pre-delivery inspection and hand over programme by Morgan Marine. 2019 model available to order for UK delivery with special offers in stock at Morgan Marine. Sport top version with electric sliding roof. 2 cabin layout with moabi woodwork. Electric windlass + anchor in self draining locker + chain counter and control from pilot station. Swim platform with ladder. Teak on cockpit floor and platform. Ventilation Pack (additional opening portholes in saloon and aft cabin, opening deck hatches in saloon, cockpit porthole in aft cabin). Forward opening stainless steel pulpit. Forward, midship and stern mooring cleats. Hot and cold cockpit shower. Forward cabin with double berth, hanging locker, windows, portholes, sockets and lights. 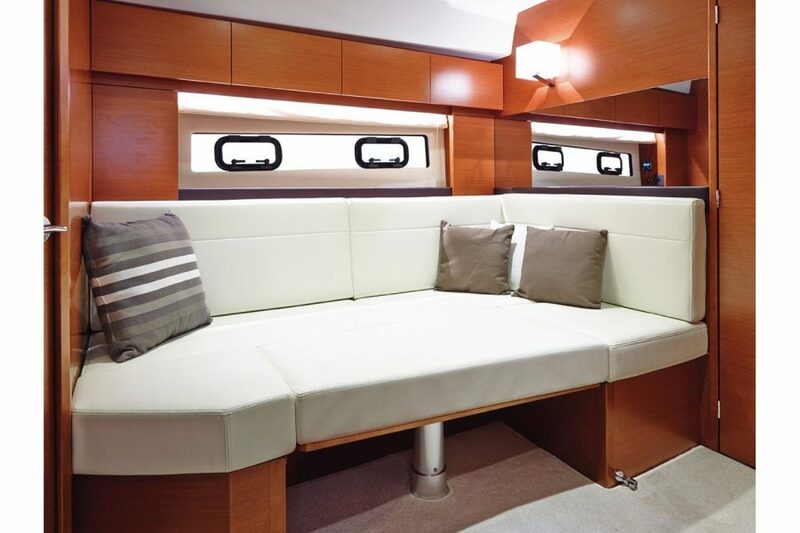 Aft cabin with double berth and single berth, storage, bench seat, windows and portholes, sockets and lighting. Heads compartment with shower, hot water, manual toilet. Galley with sink, ceramic glass cooktop (220v) and 80L fridge. Varnished table. Removable carpet set in saloon and cabins. Curtains for saloon, cabins and heads. White lacquered finish on the doors (galley & saloon). Pilot bench seat + co-pilot Meridienne (sun lounger). Opening cockpit windows to port and starboard. Removable teak step at helm station. U-shape cockpit saloon. Wooden cockpit table. Cockpit locker. Compass. Port and starboard windscreen wipers + windscreen defogger. Horn. Cockpit galley - sink with pressurised water. 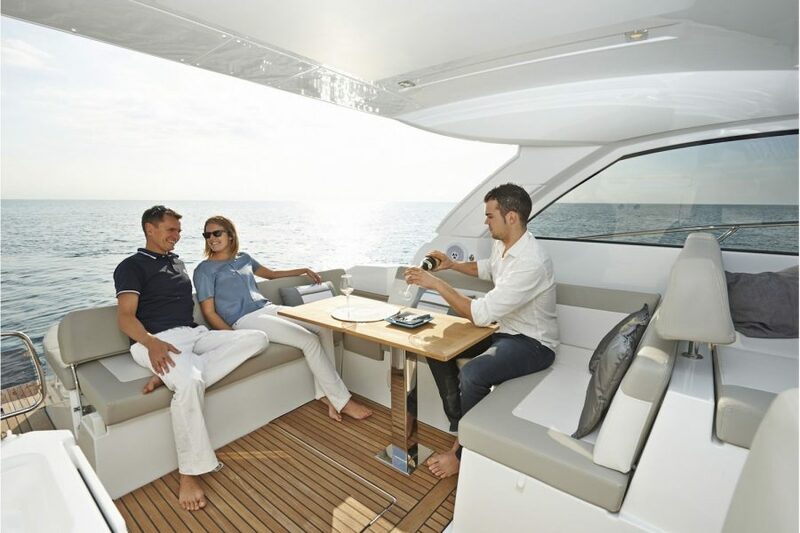 Raymarine Electronic Pack 2019: Axiom 12 (GPS chartplotter / sounder with 12" touchscreen), wifi connectivity to control from tablet or smartphone, P79 depth transducer. Volvo trip computer. Ambiance Pack (LED lights in outside steps and in cockpit saloon + inside indirect lighting + cockpit spotlights). Shore power with battery charger and 12 / 220v sockets. Navigation lights. 2x Volvo D4-300 HP - diesel. Forced air diesel heating. Electric and manual bilge pumps. Fuel capacity: 2x 362L. Water capacity 250L. Holding tank capacity: 120L. CE category B for 10 (offshore) and C for 12 (inshore).